From February the Suzuki naked range is extended with the arrival of the SV650X-TER. This is a Limited Edition developed on the basis of the SV650X. 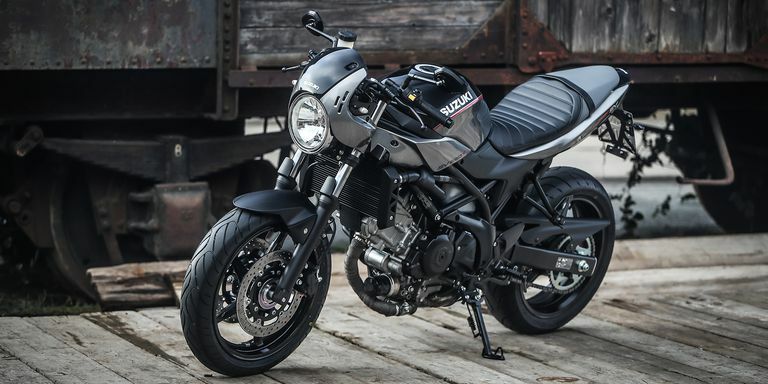 Inspired by racing bikes of the past, the Suzuki SV650X-TER stands out, at first glance, for the exhaust system that presents two innovations: the first are the manifolds banded with thermal bandages, the other concerns the approved double trombone silencer by Fresco. The body, light and slender, helps to make the silhouette of the bike more athletic. The driving setting reflects the character of the SV650X-TER. The dumbbell seeds define a slightly forward position. Available with a series of devices such as the Suzuki Easy Start System and the Low RPM Assist, which facilitates start-ups and starts, this bike is equipped with the Euro 4 twin-cylinder engine that unites all the Suzuki SV650s: its power is 56 kW (76 hp), and the reduced version to 35 kW is also available for A2 license holders. The Suzuki SV650X-TER is available in the same way as the SV650X. The two-tone Glass Sparkle Black-Metallic Oort Gray paint, black / gray, is combined with the white Suzuki lettering on the 14.5-liter tank and black footrests and levers, which underline a maniacal attention to detail.